LIC AAO Final Result 2015 Declared - Download Interview Result & Appointment Offer Letter of Provisionally Selected Candidates. This is latest news is that Life Insurance Corporation Of India has declared final result for the post of Assistant Administrative Officers (AAO) in Generalist for Jammu & Kashmir, North Eastern Region and CA posts. The final result has announced on 03rd September 2015. 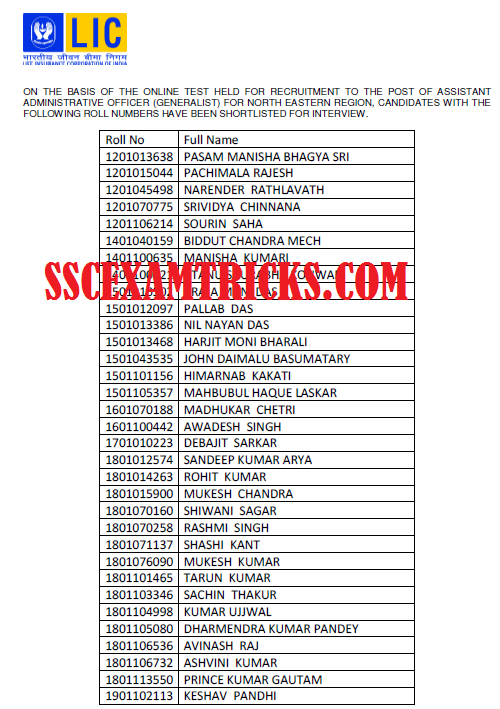 The list of selected candidates based on written test and interview has been published for these posts. The Appointment will be provided after the successful candidates of pre recruitment medical examination. The pre-recruitement medical examination is planned to be held on 07th September 2015 to 12th September 2015. The provisionally selected candidates has called at divisional offices on these dates. The final result of pre-recruitment medical exam will be declared on 04th October 2015. The selected candidates induction training will be commenced on 05th October 2015 onwards. The intimation of final result has been sent on email address registered on the official website. Check LIC AAO Exam 2015 Result - Download LIC AAO Exam 2015 Answer Keys - Download LIC AAO Exam 2015 Cut off Marks - Check LIC AAO Exam 2015 Merit List – licindia.in. LIC AAO Exam 2015 Result Updated News: The Latest news is that LIC has released result/ shortlisted candidates qualified for interview on official website. on 23rd June 2015. 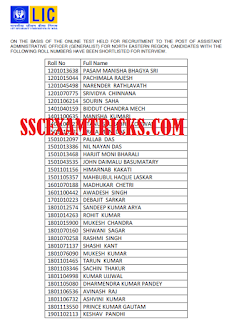 Those candidates who had appeared in this written Test and waiting for their result/ scorecards/ marks details; they can download their result / scorecards / merit list direct link provided below. LIC AAO Exam 2015 Merit List Cut off Marks: The LIC AAO EXAM 2015 was conducted on 15th, 21st & 22nd March 2015 by ONLINE Mode. The Written test was an objective multiple choice question paper pertaining to English (40 marks), Reasoning (30 marks), Quantitative Aptitude (30 marks), General Awareness (30 marks) and Computer Knowledge (30 marks). The exam was a multiple choice question paper of 160 questions of 300 marks in which four options will be provided out of which candidates had to choose one correct answer. There was a 1/4th negative marking for each wrong answer. Candidate will have to qualify each section of ONLINE examination. The minimum marks to be obtained in each Section and in the aggregate shall be decided by LIC of India. English Language test is of qualifying nature and the marks in English Language will not be counted for ranking. LIC AAO Exam 2015 Answer Keys: Life India Insurance had successfully conducted online written examination on 15th, 21st & 22nd March 2015. The written test was rescheduled through due to large numbers of applications received by LIC. The written test was organized at various centres in all over the country for 200 vacant posts of Assistant Administrative Officers (AAO). Earlier LIC had invited online application from 05th January 2015 and the last date to apply was 22nd January 2015 on official website for these posts of AAO in various departments. A huge numbers of candidates had applied these posts. Large numbers of candidates had appeared in the written examination. · Save and print the Result/ Scorecard Hard Copy for appearing in Interview. The result of the written test will be announced very soon by LIC. The qualified candidates will be called for 2nd stage of Interview round. Interview Call letter will be provided on the official website of LIC which can be downloaded from the link say ‘CAREER’. About three times more candidates from vacant posts will be called for interview. All the selected candidates must reach the venue of Interview at least 20-30 minutes before the time mentioned on the interview letter of the candidate. Selected candidates are required to bring computer generated online application, result print, original documents (10th, 12th, UC DMC, Cast certificate –If applicable etc.) and one set of self-attested of all the documents to the venue of interview. 10th Certificate is used for Age Proof. Candidate must bring at least one Address proof i.e. PAN Card, Ration Card, Aadhar Card, Voter card or Driving License. Candidates are advised to bring two extra colored recent passport size photograph (same as pasted on computer generated application form) required for application form or other document requirements. Candidate must bring Caste/PWD/EXS certificate to claim for seat available for reserve category. If the candidate is an employer of any organization then it is mandatory to bring original as well as photocopy of NOC (No Objection Certificate) with them. After qualifying interview by the candidate, Candidates will have to pass pre-medical examination to be conducted by Medical Officer appointed by LIC. LIC may release answer keys of the exam which can be downloaded from the official website www.licindia.in . Keep visiting us to get fastest and reliable information of latest jobs, admit cards, results, scorecard, counseling schedule and document verification of the candidates as they frequently visit website for getting regular updates. Reader can get latest news of Haryana JBT Teachers Final Selection List, Chandigarh JBT NTT Document Verification, Chandigarh TGT recruitment latest news etc. on sscexamtricks.com. Besides this, readers can download tips-tricks & General Awareness questions answers sets for recruitment exam / entrance exam 2015-16 prepared from most popular books to the candidates to achieve cut off marks in any exam 2015-16.